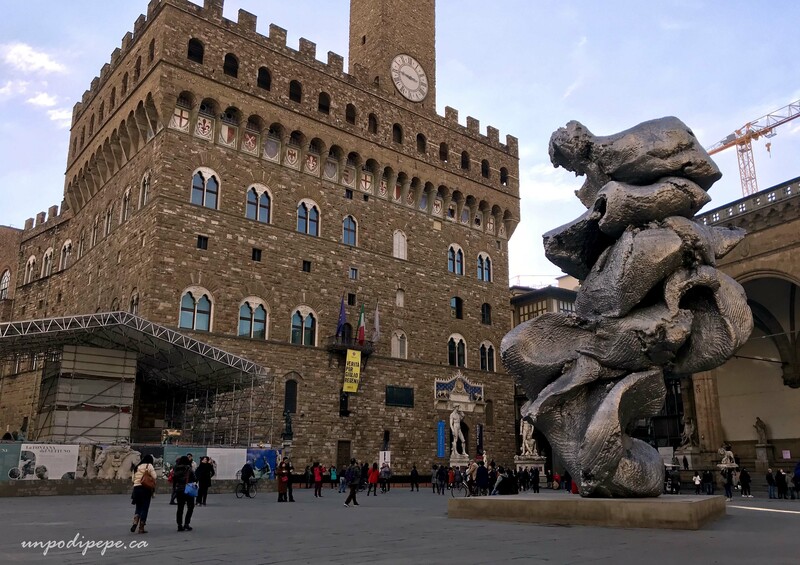 As I entered Piazza della Signoria in November, I was surprised to see it occupied by a massive excremental aluminum sculpture. Big Clay #4 is the actual title of the 12 meter high work by Swiss artist Urs Fischer. The sculpture is actually an enlargement of pieces of clay that the artist modeled with his hands. He took 5 small pieces of clay and squished them around in his hands, then piled them up. Then it was ‘supersized’ to 12 meters high. The artist’s fingerprints and palm creases that were impressed onto the surface of the clay were also reproduced. An interesting idea…. too bad it came out looking like poo. The installation of this sculpture is not a successful pairing of contemporary and Renaissance/Classic art. If I sound like a harsh art critic, let me say that I am not one of those people who just dislikes contemporary art. In fact, one of my favourite musei in Firenze is the Museo Marino Marini, housed in the deconsecrated ancient church of San Pancrazio. Marini’s 20th Century sculptures are elegant and classic and his melding of the historical and the contemporary is extremely successful. In my determined quest to find a positive angle on this work, I looked at the photo below and wondered if the artist was trying to (unsuccessfully) mimic the spiraling vortex of Giambologna’s Ratto delle Sabine. This is not the case, since I found out the sculpture was not made for this site. It was previously displayed outside of the Seagram Building in Manhattan, where it was known as the ‘Big Turd’. The work is supposed to be thought provoking. 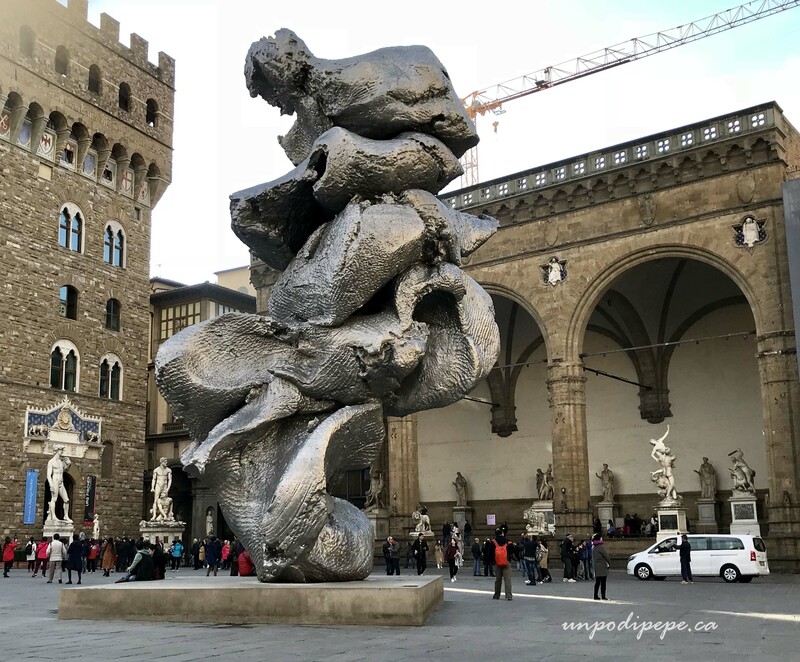 The only thought that came to me was ‘Now I know what it would it look like if a brontosaurus took a big dump in the middle of Piazza della Signoria!’ The sculpture is up until January 21st, so you only have 4 more days to see it here. My title may sound a bit harsh, but many other colourful, scatologically oriented comments were heard in the piazza and around Firenze. I don’t think many Fiorentini will be sad to see it go! Such a horrible “sculpture”. Not only is it ugly it dwarfs the beautiful renaissance sculptures already in Piazza Signoria. Disgusting! Will be overjoyed to see it go! I have seen other photos of this monstrosity. As an artist, I respect individual styles. That being said, I fail to see what the artist “saw.” I am at least happy that Piazza Signoria will not have to suffer this travesty much longer. The Cacata or my review? I suppose this is one of those instances where those who supposedly know better would say that the fact that this piece has prompted such a lively discussion makes it art. I say, the emperor has no clothes. But the only thing that really interests me is who paid for it. The transportation alone would cost a fortune. That’s the travesty. Thankfully, it will be gone in a couple of days. SO ugly and meaningless. Thanks for reminding me of the San Pancrazio Museum of Marino Marini’s work. The building itself is so beautiful. Prego Marianna! I think I was with you the first time I went to San Pancrazio, wasn’t I? Incredible place! My first thoughts were, how did my enormous dog escape and make it over to Italy to poop in the piazza??? It’s a monumental excremental! You’d need the extra EXTRA large poop bag for this piece of crap. It bothers me how much money and resources went into this piece of “art”. Maybe art here stands for “A Ridiculous Turd”. I did wonder, when I read the title of this post, what might be the subject amd now I can see- si`,veramente una grande cacata. Perhaps it might not be so jarring if placed in another piazza or in New York or in front of the white house, where una grande cacata might seem appropriate. Cristina, this is a shame….I’m so sorry that it is taking up space in a lovely renaissance piazza. I’m relieved that it will be removed! Oh happy day…. Si! Only 3 more days. Who knows where they will put it next! Hi Shelagh! Luckily it is gone now. Whew! I saw “questa grande cacata’ for myself, November 2017. Knew nothing of why it was there, but I did know that is was not the art that belonged in the same category as the beautiful art that is Firenze. So glad that someone came along and scooped up ‘la cacata’.